"We use Cannabis religiously and you can, too." 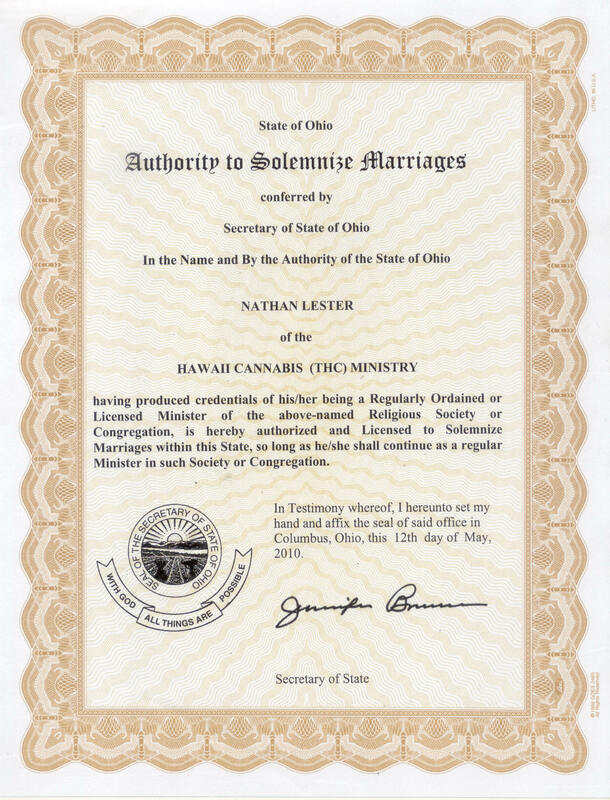 Recent Ohio Secretary of State Decision to Sanction THC-Ministry License to Marry - "The state of Ohio authorizes and confers Nathan Lester of the Hawaii Cannabis THC-Ministry to license and solemnize marriages within Ohio, "as long as he shall continue as a regular Minister in such Congregation ..." Signed by the Secretary of State of Ohio in May, 2010. State of Hawaii v. Joseph Sunderland (Appeal from the District Court of the Third Circuit) - "Following the close of the prosecution's case in chief, Sunderland called Reverend Roger Christie ("Christie") to the witness stand. Christie testified that he was ordained in the "Religion of Jesus Church," and that he subsequently organized a sect called the "Hawaii Cannabis Ministry." Christie explained that his religion centers around the sacramental ingestion of cannabis, and that the use of cannabis is mandatory in his ministry. He pointed to multiple passages from the Bible and interpreted them as indirect references to the cannabis plant. For example, Christie claimed that "the word 'kannabosm' in the holy anointing oil of Moses and the christening oil of Jesus is cannabis." According to Christie, cannabis "has a unique way of elevating the consciousness[,]" distinct from other mind-altering substances, and that prohibiting the use of cannabis would have a "devastating" effect on his ministry. Sunderland subsequently exercised his right to testify. Sunderland admitted possession of the pipe recovered by Officer Smith, and he further admitted that the residue in the pipe was marijuana. However, Sunderland thereafter testified that he was a member of Christie's ministry and used marijuana for religious purposes. Sunderland claimed that ingesting marijuana was a religious experience that produced a "very unique state of mind" that brought him closer to what he considered "God." Sunderland explained, "And . . . I believe that -- in part of . . . understanding God, I believe that God put the holy herb onto this earth to help mankind to better understand Him." At the close of the evidentiary portion of trial, the court rejected Sunderland's argument that his constitutional right to the free exercise of religion precluded his prosecution for possessing marijuana ..."
UDV (Uniao Do Vegetal): Supreme Court Case Decision - "A religious sect with origins in the Amazon Rainforest receives communion by drinking a sacramental tea, brewed from plants unique to the region, that contains a hallucinogen regulated under the Controlled Substances Act by the Federal Government. The Government concedes that this practice is a sincere exercise of religion, but nonetheless sought to prohibit the small American branch of the sect from engaging in the practice, on the ground that the Controlled Substances Act bars all use of the hallucinogen. The sect sued to block enforcement against it of the ban on the sacramental tea, and moved for a preliminary injunction. It relied on the Religious Freedom Restoration Act of 1993, which prohibits the Federal Government from substantially burdening a person’s exercise of religion, unless the Government “demonstrates that application of the burden to the person” represents the least restrictive means of advancing a compelling interest ..."
Religion of Jesus Church, et al vs. John Ashcroft, Karen Tandy, Edward Kubo (Plaintiff's Complaint for Declaratory Relief and for Preliminary and Permanent Injunctive Relief; Summons) - "The Plaintiffs are comprised of organized religious entities/churches and some local Reverends and members of said churches, as well as a registered State of Hawaii Department of Public Safety Narcotics Enforcement Division Medical Marijuana Registry patient and an anonymous registered State of Hawaii Department of Public Safety Narcotics Enforcement Division Medical Marijuana Registry caregiver. The Plaintiffs are suing for an order declaring their consumption, cultivation, possession and distribution of cannabis to be free from Federal penalty and for an order prohibiting the Defendants from seeking criminal sentences and/or criminal and civil sanctions and/or asset forfeiture under the Controlled Substances Act or any other provision of the U.S. Code ..."
Federal Case No. 04-CV-200: Defendants' Motion To Dismiss Injunction Complaint - "Plaintiffs ask this federal court to declare that they can grow, smoke, and distribute marijuana with impunity, and seek an injunction prohibiting Defendants from enforcing the provisions of the Controlled Substances Act ("CSA"), 21 U.S.C. 801, et seq., against them. Plaintiffs claim that they are entitled to this blanket protection because their cultivation, possession, consumption, and distribution of marijuana is done "religiously" and/or "therapeutically" for medical purposes ..."
People of Guam vs. Benny Toves Guerrero - "...The Superior Court of Guam found, and the government does not dispute, that Rastafarianism is a legitimate religion2 1 Guerrero has chosen to use his Rastafarian name, Iyah Ben Makahna, for over the past 20 years. Because the case caption uses his birth name, however, this opinion will also. 2 We have previously acknowledged that Rastafarianism is a legitimate religion, in which marijuana plays a necessary and central role. See United 7695 of which Guerrero is a legitimate member. People v. Guerrero, No. CF0001-91, at 4 (Sup. Ct. Guam July 23, 1999). It also found that marijuana use is sacramental in the practice of that religion. Id. Using RFRA's standard -- namely, a law of general applicability that substantially burdens the free exercise of religion is invalid unless the government demonstrates that the law is the least restrictive means of vindicating a compelling government interest -- the trial court found that the government had alleged neither a compelling interest nor that its drug laws were the least restrictive means of carrying out their purpose. Id. at 5-6. As such, the trial court held that the importation statute, as applied to Guerrero, violated both RFRA3 and the Free Exercise Clause of the Organic Act, 48 U.S.C. § 1421b(a).The Supreme Court of Guam affirmed based solely on its interpretation of the Organic Act. While it discussed whether RFRA was constitutional as applied to Guam as a federal instrumentality, its decision was based on its own interpretation of § 1421b(a). People v. Guerrero, 2000 Guam 26, 2000 WL 1299635, at *6 (Guam Sept. 8, 2000). The Supreme Court of Guam construed the Organic Act's Free Exercise Clause, § 1421b(a), as providing the level of protection found in RFRA and prior U.S. Supreme Court decisions: 4 "the government must demonstrate that some compelling state interest States v. Bauer, 84 F.3d 1549, 1556 (9th Cir. 1996) Rastafarianism "is among the 1,558 religious groups sufficiently stable and distinctive to be identified as one of the existing religions in this country . . . . Functionally,marijuana . . . operates as a sacrament with the power to raise the partakers above the mundane and to enhance their spiritual unity ...."
Activist Pressure Lead to Hawaii County Council Resolution 46-01,May 9, 2001- The Hawai'i County Police Department shall also establish written rules and regulations regarding the use and/or possession of marijuana which may be protected by State and/or Federal law and/or the U.S. and State constitutions Re: A statewide marijuana eradication grant ... "be it further resolved that ... 1. Rappelling shall be at least 500 linear feet from any residence 2. These funds shall not be used for any aerial spraying activities 3. Flights under 1,000 feet over any residential areas shall be restricted unless probable cause exists 4. A report shall be submitted to the County Council within thirty days from completion of each mission detailing the number of plants eradicated, the area (location) of the mission, the number of complaints received from the public, the type of complaints, and their disposition ..."
United States vs. Meyers - "David Meyers (Meyers) appeals from his conviction and sentence entered following a jury trial wherein he was found guilty of conspiracy to possess with intent to distribute and to distribute marijuana, in violation of 21 U.S.C.  846 (Count I), and aiding and abetting possession with intent to distribute marijuana ...Meyers filed numerous motions including motions to dismiss based on religious freedom under the First Amendment and the Religious Freedom Restoration Act, 42 U.S.C.  2000bb et. seq. (RFRA). At the hearing on Meyers' religious freedom defense, Meyers testified that he is the founder and Reverend of the Church of Marijuana and that it is his sincere belief that his religion commands him to use, possess, grow and distribute marijuana for the good of mankind and the planet earth ..."
Remarks by President Clinton at the Signing Ceremony for the RFRAC - "... As the Vice President said, this act reverses the Supreme Court's decision, Employment Division against Smith, and reestablishes a standards that better protects all Americans of all faiths in the exercise of their religion in a way that I am convinced is far more consistent with the intent of the founders of this nation than the Supreme Court decision. More than 50 cases have been decided against individuals making religious claims against government action since that decision was handed down. This act will help to reverse that trend -- by honoring the principle that our laws and institutions should not impede or hinder, but rather should protect and preserve fundamental religious liberties. The free exercise of religion has been called the first freedom -- that which originally sparked the development of the full range of the Bill of Rights. Our founders cared a lot about religion. And one of the reasons they worked so hard to get the First Amendment into the Bill of Rights at the head of the class is that they well understood what could happen to this country, how both religion and government could be perverted if there were not some space created and some protection provided. They knew that religion helps to give our people the character without which a democracy cannot survive. They knew that there needed to be a space of freedom between government and people of faith that otherwise government might usurp ..."
State v. Blake, 5 Haw. App. 411, 695 P.2d 33- "...Where a constitutional challenge on the First Amendment religion grounds is made, we appy the following test: To determine whether there exists an unconstitutional infringement of the freedom of religion, it would be necessary to examine whether or not the activity interfered with by the state was motivated by and rooted in a legitimate and sincerely held religious belief ..."
The Supreme Court of Florida Found:(1) the Ethiopian Zion Coptic Church represents a religion within the first amendment to the Constitution of the United States, and (2) The "use of cannabis is an essential portion of the religious practice." Town v. State ex rel. Reno, 377 So.2d 648, 649 (Fla. 1979), cert. denied, 449 U.S. 803 (1980). "Further, the Ethiopian Zion Coptic Church is not a new church or religion but the record reflects it is centuries old and has regularly used cannabis as its sacrament." Please send any legal precedent research you know of to us here. Mahalo.